Linebacker Micah Parsons (11) leads the Nittany Lions in tackles. Micah Parsons is entering his sophomore year at Penn State, where he has a legitimate chance at becoming one of the best linebackers in the Big Ten this season. But his journey to get to this point was anything but conventional. In fact, Parsons himself called it “bizarre” – his recruitment as a top-five player in the nation in the class of 2018. “I kind of didn’t know where I wanted to go,” Parsons, of Harrisburg, said Tuesday in his first conference call with reporters as a Nittany Lion. “Obviously, I was highly scouted and all these coaches were looking at me. I tried to show love to everyone. All the facilities were great. All the people were great. It was kind of crazy, because nobody knew where I was going. Penn State was still in the mix, but so were Georgia, Oklahoma, Ohio State, Alabama, and Nebraska. It wasn’t until the morning of the early national signing day – Dec. 20, 2017 – that Parsons made his final choice of the Nittany Lions over Georgia and Oklahoma. Parsons enrolled the next month and went to work “to show people that I was more than just a football player and a bizarre kid on social media." A defensive end in high school, Parsons was moved to linebacker last spring. Franklin marveled at Parsons’ ability to make plays without knowing the fundamentals of the position. Hie playing time increased as his freshman season progressed. 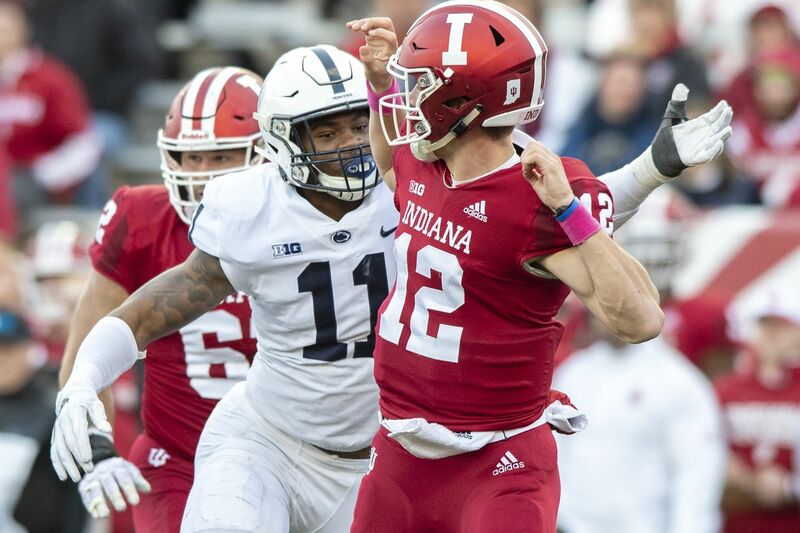 Even though he started just one game, he became the first freshman (true or redshirt) to lead the Lions in tackles, posting 83 of them, and he earned honorable mention All-Big Ten. The 6-foot-3, 245-pound Parsons credited defensive coordinator and linebackers coach Brent Pry with staying by his side during the recruiting process and contributing to his improvement. Parsons, who played weakside linebacker last season, has worked at both outside spots this spring. He said he has worked hard on his footwork and his technique, and he’s primed to have a big year.